Stamp with Melva: Free Ribbon! While the kids are heading back to school, Stampin' Up! is going back to 'spool'! 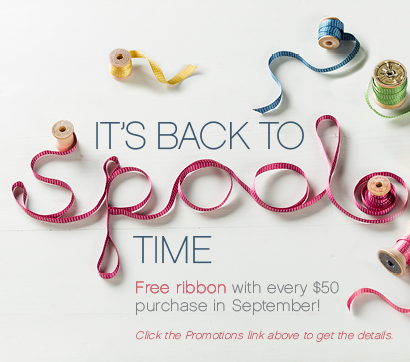 For the month of September, get a FREE package of 3/8" Stitched Satin Ribbon-an $12.25 value-for every $50 you spend! What a great way to stock up on the new in colours of ribbon. You can place your order online using my online store or email me your order.